Seasons Greetings from the Naked Scientists! We invite you to spend the next hour with us as we explore the Science of Christmas. We'll be looking at why crackers are, or aren't, all that funny, the chemistry of Christmas and what makes the ultimate roast dinner as well as whether wine really is the best medicine. 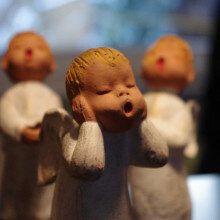 Christmas carolling is one of the traditions that really has stood the test of time. But how and why do we sing? 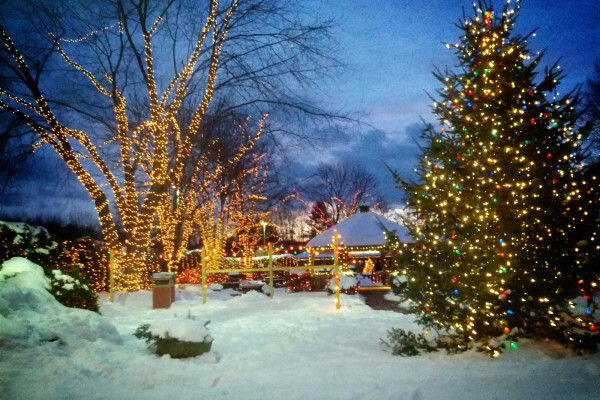 Christmas carolling is one of the traditions that really has stood the test of time. But why? It could be that singing and in particular choral singing, has some effects that other group activities don't... Jude Brereton teaches the science of singing at the University of York and began by telling Chris Smith how we sing. Chris - There's one on each side, isn't it? Jude - One on each side, absolutely. Chris - They meet in the middle and they can move apart and move together. Jude - They do and they do that very, very rapidly. So, if one of our singers were to sing let's say, a middle C on the piano, that's around 260 hertz, that's 260 vibrations per second. Chris - So that would mean my vocal chords are opening and closing 260 times a second. Chris - And that is interrupting the flow of air coming out of my trachea, the windpipe. Chris - 260 times a second. Chris - So, what does that then do to the sound as it comes up my throat then? Jude - That makes actually just a very simple buzzing sound. So, I've got here an electrolarynx. This is a device you would need to use if you had to have your larynx removed and it just makes a buzzing sound. Chris - Sounds rather rude. Chris - It's literally the size of a stick of dynamite. Chris - It's a little cylinder. Jude - It is and that buzzing sound, that rude buzzing sound, that's the sound we would hear if we were to get our singers and chop their heads off. That's the sound we would hear just directly above the vocal folds. Chris - You've got the Templar Scholars here and they're wearing a fashion accessory I haven't seen for about 20 years. They're all wired up. I've never seen a choir wearing electrical apparatus resembling chokers. Jude - Yeah, I'm amazed. Chris - What is this? Jude - They've allowed me to put electrodes on their necks. Chris - That's so we can strangle them if they don't sing well. Jude - Yeah, we could probably do that. So, the electrodes we got there, there is a current going from electrode to the other. So, they've got a pair of electrodes - one on each side of the larynx. Chris - There's a little belt like a choker thing and it's got these two disks. They're about 2 pence piece size sticking on the side of their neck. Jude - Absolutely and it's attached with Velcro at the back, so you can take them off if you begin to feel too uncomfortable. But what it does allow us to do is to find out more about the actual vocal fold vibration itself. So Chris, if we ask the choir to just sing one verse of a Christmas carol, we'll have a little listen later to just their vocal folds. Chris - Very much enjoyed the singing. What did we capture electrically from their larynx? Jude - So electrically, we've just captured the raw signal of the vocal folds moving. We should be able to listen to that now. Chris - Much better. What's actually going on there? What are we hearing? Jude - So, we're literally just hearing how the vocal folds vibrate. So, that's the sound source that you put into the vocal tract and then you need the vocal tract to transform that sound into words and into different shapes of notes. Chris - That sound obviously isn't the sound that comes out of my mouth. So, how do those puffs of air change as they come up and turn into A. a note and B. in my case now, speech? Jude - The note itself is regulated by the vibration of the vocal folds. So we can tension and de-tension a vocal fold. So, if they're under more tension, if they're thinner and longer then they'll make a higher note. Chris - Is that because they vibrate, they move up together in the part more quickly? Jude - Absolutely. So, thinking about that middle C again, that was about 260 times per second. If you were to sing an octave above that then that would be 520 times per second, and then another octave above you going 1,040 times per second. Chris - Are you aware of your vocal chords bouncing backwards and forwards up to 500 times a second, Victoria? Victoria - It's amazing isn't it when you think about it. Chris - Tell us a bit about your singing experience and does this sort of just happen naturally to you or have you actually had to have training and actually being aware of what's going on in your neck as you're producing lots of beautiful sounds? Victoria - Well, if you imagine going into a primary school playground and seeing little kids running around, the sound that they are producing is enormously loud, enormously free sound which would challenge any operatic tenor in the best London circuits. But somehow, over our lives, as we get more stressed and more worried, all of these things shutdown. We try and make ourselves sound better and so sometimes, singing is just a case of getting back to what's natural. Chris - And relaxing a bit. So, how do I make sounds into speech then? Chris - It looks like something out of alien actually. Jude - It does a little, doesn't it? It's actually a 3D printed vocal tract of a particular singer, singing a particular vowel. Chris - So in other words, you've taken a scan of the innards of somebody and extracted the bit that corresponds the windpipe, vocal folds - in other words, vocal chords, the back of the throat and out to the mouth because it does end in the mouth. Jude - Yup and we've even got lips on this model here. So, absolutely right. We did that, we had a singer in the MRI scanner and they sang a particular vowel. Now, this vowel I brought for you today is an "aahh" vowel. What I can do is I can attach this to the buzz of the electrolarynx we heard earlier. Chris - So, you're just going to put some vibrations into it. Chris - So squeezing the tube and changing the shape. Jude - Squeezing the tube and changing the shape. So, if I squeeze the end of tube, I should get an "eeh" vowel because that's what your mouth is doing when you make an "eeh" vowel. It's squeezing the end of the tube. Jude - Absolutely, towards the mouth. And if I squeeze the back of the tube then we should get an "ahh" vowel because that's what your mouth does when you do an "ahh" vowel. So, I've been practicing this. I hope it works. Chris - I'm glad I've got a tongue, which makes life a lot easier than actually doing that. So, if Tori has a high voice and sings in a much higher set of notes than I do and presumably you do, is that just because I'm a different shape in terms of my larynx in my mouth to her and you? Jude - So, female vocal folds are generally shorter than male vocal folds. So, they make a higher sounding pitch. Chris - And Tori, the other benefits of singing of course, it isn't just about making the audience enjoy it, it's enjoyable for the people who do it as well. Tori - Absolutely. When you're singing, as you said earlier, an awful lot of learning how to sing is getting in touch with your breath system and that might sound similar to some of you who've maybe had hypnotherapy or other stress and relaxation techniques in the past. You are encouraged to get in touch with your breath. So in fact, what singers are doing is finding a way to ground themselves, calm themselves down. Singing can be enormously beneficial for you from a very physical point of view. 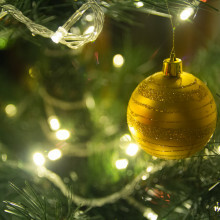 How many chemicals do you think your body interacts with at Christmas? Loads! They're everywhere, in the Christmas jumpers you're wearing, the wrapping paper you've ripped to shreds and even in the preservative on your Christmas tree that stops the needles falling off. Mark Lorch is a biochemist from the University of Hull and he unwrapped the chemistry of Christmas for Chris Smith. Chris - You mentioned that you were joining us earlier and you've been vigorously peeling an orange, but not for personal consumption I hope, not in the chemistry laboratory. Mark - No, of course not. The thing about orange peel, and one of the reasons why it smells so nice, is there's a chemical in this peel called limonene. Limonene is incredibly flammable. So flammable in fact that you can turn a bit of orange peel into a flame thrower. Chris - Flame for the Christmas table? Mark - Yeah. If you've got candles around it, just follow normal safety. Chris - So, we have one of my beautiful crystal candlesticks here and there is a candle sticking at the top of it and you have peeled the peel off of a very large orange and you bent the peel over. So, you're just going to squeeze the peel onto the candle flame. Mark - Exactly and watch this. Mark - Isn't that fabulous? Chris - That was about a foot high. Mark - That was a really good jet of flame there. Chris - Is that a trick stunt orange or is this for real? Mark - No, this is just a normal navel orange. Shall I get another so we can do it again? Chris - But there was an absolutely huge fireball that came off like a fruit fireball that came off of this orange. And it was a bright whitey yellow flame - burnt very fast. Why is this happening and what's coming out of the peels? Mark - So, the stuff in the peel is this chemical called - is an oil called limonene and it's what smells so lovely when you squeeze an orange or a lemon in fact or any citrus fruit. As I said, it's incredibly flammable so you can get these nice jet of flame. Chris - What is it doing in the orange? Mark - I believe it has insecticidal causes actually. Chris - As well as taste and other properties. Mark - It's smelling and tasting really nice. That's part of the reason why we put rind in things into cakes, etc to get that lovely aroma. Chris - Because people used to dangle oranges in various places - on Christmas trees they used to put them in their wardrobes to ward off insects. It repels moths very well I'm told. Mark - So, I believe. Chris - So, as you squeeze the peel, you're literally putting jet to the stuff into the flame and off you go. Mark - Exactly. And actually, there's another interesting thing about the limonene. It's the same compound in lemons and oranges, but they smell different. How did this something that's essentially the same smell different? Well it's because in the orange and the lemons, the compounds are mirror images of each other. Now, our body interacts with different mirror images of compounds in different ways. Chris - So, what you're saying is, you've got a molecule that's like a left hand version and a molecule that's like a right hand version because you have two different gloves, one for each hand. They're both hands. They both look the same. Both got 5 digits but they're mirror images. Chris - And the molecules smell different because they bind differently in our noses. Mark - No. but actually, now you've mentioned it, sometimes if you taste caraway, you can almost get a vague hint of spearmint in there as well. Chris - Well, there you go, fireballs for your Christmas table. What about making some baubles for my tree though? Mark - Right. Traditionally Christmas baubles are mirrors for example, they were silvered. The silvering reaction is actually really quite a simple bit of chemistry and I'm going to try and make now, here at the table a Christmas bauble out of something you wouldn't normally hang on a Christmas, although they do hang on mine, round bottom flasks. Chris - Beautiful piece of laboratory glassware. Do you really hang those on your Christmas tree because that is lovely? Chris - Okay, so we're going to make the silver on the outside or the inside? Mark - On the inside. So, we're going to put the silver on the inside of the bauble. I'm going to start off with a silver nitrate. So, this is a colourless liquid. Now, this is a totally colourless liquid, put that silver in there. Now, the next thing I have to add and this bits a bit stinky, I've got to add some ammonia. Mark - It's liquid and a bit smelly and it goes brown. Chris - It smells absolutely disgusting like we've gone into a gentlemen's toilet. Mark - The solution has gone brown. That's silver oxide and that doesn't dissolve in this solution, so it goes - so, we lose it but as I add more ammonia, it then goes clear again. Chris - So, we started off with a clear solution, you added the ammonia and it went to dark colour. Now, it's gone back to clear. So why has that gone clear? Mark - That's because it now got something called diamine silver that dissolves in this bottle. Now, what I've got to add is a little bit of potassium hydroxide and this makes it alkaline. It goes dark again and that's ready now for the final step, which is just to add some sugar. So actually, this is dextrose I'm using here. Now, it goes dark slowly. You can see it's got a brown colour and that is actually sort of black colour. Now, that is a silver coming out in solutions. That's particles of silver and it will start to coat the inside of the bauble. Chris - What's actually going on in there to make the silver come out and stick to the glass? Mark - So, this is a reaction called toluene's reagent. We use it actually in chemistry labs for figuring out whether compounds have aldehydes, a particular type of chemical in it because this reaction only works with aldehydes. When we react the ammonium silver complex with an aldehyde which you get in these sugars, it causes the silver to come out of solution. Chris - It's just convenient that it does that and sticks to the glass. Mark - Yeah. So, we use it as an analytical tool in chemistry. It's also long been used to make silvered mirrors and silvered baubles. Chris - Fantastic! What else have you got for us? 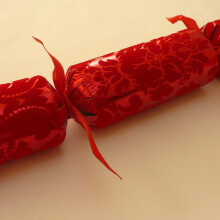 Mark - What's Christmas dinner without crackers? Chris - And I did this time. So, what did I get? Chris - I've got a notebook. It's a really good gift that. Mark - That crack from the cracker and also party poppers, but there we go. That is a small explosion from a very, very unstable compound called silver fulminate. It's so unstable that if you make more than a few hundred milligrams of this stuff, it actually explodes under its own weight. Chris - Goodness! So, how do they make it then? Mark - Really quite easy to make, but you just don't ever make much of it. You get the same stuff in - you know, the bang snaps you throw at the ground, etc. It's incredibly unstable. Chris - But what's actually happening in the party popper when I pull the string or in the cracker when you pull that piece of brown card and the two ends come away? What's happening? Mark - So, you've got about 50 milligrams of silver fulminate in a cracker like this. So, tiny amount and it's painted on one side of the strip. On the other side, you have a bit of abrasive. Chris - You're holding the snap a bit out of the cracker in your flame. Mark - Yeah, in the candle flame. When it goes off - let's see if that works - it puts out the flame. Did you see that? Chris - Yes, it has now gone out. Mark - It has because the explosion is actually that vigorous that it essentially blows out the flame. Of course, the other reason for that is the explosion produces nitrogen and carbon dioxide. Mark - ...Which doesn't burn. So, there you go. Chris - So, there's your answer. If you set fire to your house doing your flame throw experiment, you can put it out by throwing in a huge box of crackers. Mark - Yeah. I'm not sure that's going to work. If you have enough silver fulminate to put out the fire, it would also take down your house quite easily. Chris - Well obviously, no Christmas table is complete without the cake. Chris - So, what can you do with Christmas cakes? Mark - Well, there's a bit of chemistry that of course goes all the time when you're baking. There's loads of chemistry that goes on in baking and cooking. One of the simplest ones to show is a quick demo with sodium bicarbonate and you've probably have tried this sort of thing at school when making volcanoes. The bicarbonate in your cakes is there so when it heats up, it liberates carbon dioxide, which is what the bubbles are when you bake. Chris - Until the bicarbonate breaks down and make some carbon dioxide. That literally inflates the cake. Mark - Exactly, yes, blows up your cake but a lot slower than the fulminate, yeah. You can do the same thing if you just add vinegar to bicarb. Chris - So, we've got a spoon full of bicarb in a glass jar here on the table and it goes from white wine vinegar and it's popping up. Mark - Exactly, yeah. You could use any vinegar you like. Chris - So, you could use heat but you're using vinegar. What's going on? Mark - So again, the bicarbonate - the same sort of thing is going on in your cakes except in this case, the acid is reacting with the bicarbonate to produce carbon dioxide gas as well. Chris - Mark, it's been a huge pleasure. Thank you very much. I noticed I'm holding our homemade bauble and it's fantastic! It has completely silvered and covered the inside of the flask. It does look really rather good. Can I have this for my Christmas tree? Mark - You may of course. They're quite heavy, but yeah. Stick a bit of thread through the clip on the top there and hang that on your Christmas tree. Chris - Proper chemist's Christmas tree. I have a reaction vessel to hang on my tree. 22:18 - Why are Christmas cracker jokes funny? No Christmas is complete without some terrible cracker jokes but why do we find them so funny? Why are Christmas cracker jokes funny? Let's get serious about those cracker jokes. Crackers go back to the mid-19th century when London confectioner Tom Smith started by adding love messages to the wrappers for his bon bons bon sweets. As the years wore on, mini fireworks, mottos, trinkets and finally cheesy jokes were added to the mix. At the risk of examining an inherent human trait that's probably better left alone, if we're going to look at the science of why Christmas jokes are entertaining, we have to look at the psychology of laughter. Elena Hoicka from the University of Sheffield told Chris Smith how children come to understand puns and why cracker jokes are (or aren't) funny. Elena - Babies actually start laughing as early 3 to 4 months, but not necessarily at jokes. So, they might laugh spontaneously or someone tickles them. But even in the first year, babies do start to understand things that are funny. So, in one study, they found that if mothers did things like put a sock in their mouth, babies around 10 months would start to laugh at this. Chris - Why is putting a sock in your mouth funny? Elena - Yeah. Basically, I think what a lot of cognitive psychologists would agree is that humour involves something that's unexpected, out of the ordinary. And so, putting the sock in your mouth, that's kind of strange. So, you might laugh at that because it seems kind of strange and you can take joy from that. Even though jokes get more complicated, this kind of unexpectedness is usually at the heart of most jokes. Chris - If I were to look inside my brain when I'm laughing or something, when I'm being tickled by something whether it's one of those rubbish jokes I told earlier or actually something genuinely funny, what actually is happening in my brain to make me titter. Elena - So, what happens is there's activation in the dopamine area of your brain and when I say 'dopamine', this is an area that can make you feel good. Other areas in your brain can activate too depending on the kind of joke. So, if it's a kind of joke where it might be about understanding human interactions then areas of the brain to do with things like understanding how people think, social cognition, those brain areas will activate as well. Chris - But there are different types of things that are funny, aren't they? Chris - There is the literally putting the sock in your mouth and laughing at that because it's a bit unusual. But then there are clever plays on words, which they're not visual but they're crafty plays on words and they're funny in their own way, aren't they? Is it then that laughter is like a final common pathway and there are different ways to activate that? Elena - So, I think kind of coming back to this idea that something is funny if it's unexpected, it really captures both of those types of jokes. Chris - So, like a funny cracker joke would actually be funny because it's unexpected. Elena - Exactly. So often, the punch line of a cracker joke, it just sounds kind of weird when you first hear it. When you think of the second meaning, then it starts to make sense. And so, you hear something unexpected and then you kind of solve that problem, and so, it makes you feel good and it's enjoyable and you find it funny. Chris - What about, going back to your research on age, How kids learn from an early age to find things funny or develop humour? Does everyone develop the same sense of humour? Does it matter whether you're living on one side of the world speaking one language or living on this other world speaking English? Do you find the same sorts of things funny? Elena - I suspect initially, babies will find the same types of things funny such as blowing raspberries or hearing strange sounds. But parents play a really big role in development of their children's humour. So even in the first year, parents will go clown around, they'll make silly faces, and at 3 months, babies don't really get it. They don't seem to laugh or smile in response to the parent's behaviours, but by 6 months, they do. So, it seems like they're starting to learn what's funny. In my own research, we found that even by 18 to 24 months, parents, when they tell a joke, they essentially explain it. So, I think they might be a bit afraid that the kids don't get it or they might learn the information and think it's true. So, if they say something like ducks say moo, will often then follow that up with, ducks don't say moo. What do ducks really say and really make sure their kids understand it was a joke, why it was a joke, and so on. So, in terms of different types of jokes in different parts of the world, the styles of jokes might be similar, you have word play all over the world for instance, but the content might be different. So, depending on your cultural values, you might find different things funny. So, maybe a capitalist society would find some notion communism funny and a communist society would find some notion of capitalism funny. And that's really going to be about your culture although the format of the joke might be similar. Chris - Can we try it if I give you some kids? Do you want to have a go and see if some of your predictions are right because I've got some kids on tap? Actually, I'm going to lend you my children. So, what would you like to start with, a younger one or an older one? Elena - We could start with a younger one and see how it goes. Chris - Well, this is Tim. He's 6. What would you expect his humour capacity to be? Elena - Certainly, from 2 years up until about 7, children really appreciate the nonsense humour. So, they might not understand puns as puns, but they might find a pun funny just because it sounds kind of crazy and weird. So, with the kind of Christmas cracker jokes, you might find them funny, but maybe for a different reason to why and adult would find it funny. Chris - Okay, so let's give it a go. Elena - So, what's the loudest things Santa eats? Tim - I don't know. Chris - So, he's actually laughing. Why is that funny? Tim - Because it is. Chris - So, he can't explain. Did he laugh because we laughed? Elena - That's possible and research finds that as kids get older, they're usually better explaining the jokes and certainly, children research finds will laugh if other people laugh, but he have also just found it funny that Santa would eat a Christmas cracker because it's not edible and it's paper and it's kind of strange. Chris - Well, let's go up the scale a bit. So Amelia is 8. What would you expect her to be able to grapple with joke-wise? Elena - I think in this particular case, she might just kind of be about the brink of understanding that there's maybe two meanings going on here. Chris - Okay, so let's stress test her. What have you got for her? Elena - Why did the man get fired from the orange juice factory? Amelia - I don't know. Elena - Because he couldn't concentrate. Chris - That let her kind of cold. So, we're all laughing, but do you have any idea why that's funny Amelia? Elena - Can I try another one? Let's try another one. What do you call a cow that plays the guitar? Chris - Well, that got a sort of vague titter. So, why do you think that's funny, Amelia? Amelia - Well, cows go moo and if it's playing a guitar, it sounds like the musician sounds like moo-sician and it's funny because it's a cow. Chris - So, it's funny because it's a cow being a musician, but there's a play on the fact that the cow goes moo. So, she obviously got the joke. Elena - Yeah, that's a fantastic explanation as well. So, you could really hear from her explanation, she understood the two meanings to that word. Moo-sician is kind of made-up world. Chris - I thought she explained it because I'm still grappling with myself. Elena - And it shows that she can hold two ideas in her head at the same time, this is related to operational thinking. So, it's kind of a stage and development when it's not just in terms of humour but also, where you understand that maybe a tall skinny glass of juice actually contains the same amount as this short fat glass of juice. Chris - But some jokes are also very cultural context dependent. If I say to you, why does a Frenchman only have one egg for breakfast? Chris - Because one's an oeuf. Chris - It depends on you having that knowledge that an egg means - but it's the same sort of mechanism. It sounds like the word that you want. Elena - Yeah, so for that one to work, if people don't oeuf is egg in French then if you didn't know that, you wouldn't quite get the joke. If you understand that then actually, that's a nice bilingual pun just on there. Chris - Well, I'm glad we brought up because it gave me an opportunity to deploy that rather rubbish joke. Lastly I want to ask you about, obviously, it is Christmas and in a minute, we're going to be tasting some extremely fine wines. What about the business of when you get drunk, you find everything incredibly funny? Is that just because you find everything funny for some reason because disinhibiting bits of your brain or is it actually doing something else to you? I mean, obviously you're working on child psychology. Alcohol and child probably won't have to do with it. Elena - We don't know how to put those two together. Chris - But why do you think that might happen? Elena - Okay. So, one possibility is that you are disinhibited. You might just be jolly or you might laugh more when other people are. Another possibility could be that maybe it's kind of changing how you're interpreting unexpected things. And so, instead of being grumpy about it or being concerned, you might enjoy it more. Chris - Elena, thank you very much. Before you go, we made Mark pull a cracker. Would you like to please pull a joke out of that? come on, give us a parting joke. Elena - What is father Christmas's favourite band? Chris - I don't know. 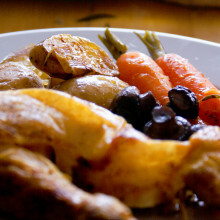 Even for experienced cooks, Christmas dinner is a challenge. But how good (or bad) a meal tastes isn't all down to what's on your plate. Ophelia - Taste interacts with a lot of your olfactory system. Ophelia - Your nose. Volatile components rise up and reach the piriform cortex, which is the olfactory receptors. This retronasal smell gets bound with the taste you're experiencing. Chris - I see. So, I put something in my mouth, yes, I get the sensation on my tongue around my mouth, but there are other chemicals coming out of the food that go up the back of my throat - for want of a better phrase - and they're activating my smell system. But I don't regard them as a smell. I am regarding them as a taste. But actually, it's the whole thing mixed together. Ophelia - Yeah. We call this oral referrals. So, the sensation is not experienced at the place where you actually receive the stimulation. Chris - How can one exploit this in order to maximise the enjoyment of food? Ophelia - So, because smell is involved in flavour experience then you can understand why some of the expectations that you will have come from your sense of smell. So, when you enter a room and you have this delicious smells floating around then it's already the same component you will experience when you actually taste the food. So, the pleasure of anticipation is already at stake. So, keep the doors of the kitchen open. Chris - We were hearing just now from Elena about how children learn to integrate information to make jokes funny because they can hold several things in their mind at once. Do you think the same applies then to flavours that when you're experiencing a flavour that actually, because a flavour doesn't just come and go. Actually, it evolves in your mouth and you experience different things at different times. Do you think that actually is why adults are better at enjoying certain flavour experiences than things would be because they've got to hold those experiences in their mind all at once? Ophelia - So, there's probably less multisensory integration going on in the flavour system of children, but what is going on also when you're young is that you really want to keep track of what you're eating. Most children will want to have the vegetables not touching the meat. What is going on is a sort of clever way of learning to connect what you experience in the mouth and the shape and the colour of things so that later, you can actually know how to mix them. But before that, you will keep them separate. Chris - What about other sorts of stimuli? What about sound as well though? If I place a music in a restaurant or if I eat an airline meal, do I experience the food differently on an airplane with all that noise going or the Indian restaurant playing that very Indian music? Do I get a better flavour experience? Ophelia - So, this is part of a fascinating series of research projects we've been conducting and the fact that sounds actually affects your flavour experiences. Chris - So, it does. Ophelia - Yeah, absolutely. In an aircraft, the sounds that you hear will actually lower your taste perception. Many people will order tomato juice in a plane, I do. Chris - With vodka added. Chris - This is this very meaty flavour compound, isn't it? Ophelia - Yeah. All the other tastes have sort of become dull because of the background sound, but umami resists. Chris - Then if I fly business class and I get my noise cancelling headphones on, is that going to mean the food taste better even though it might not be any different? Ophelia - The food will taste better because of these beautiful noise cancelling headphones. Chris - So, that's true. Ophelia - Yeah, but you will have also heavier cutlery. Chris - And that makes it different? Ophelia - Absolutely, to the perception of creaminess. So, you just have a way in which - because it feels heavier on your hands then you will think, ahh! It's because the stuff on the spoon is actually more dense. Chris - So, when people say, look, drinking tea just doesn't taste right or wine does not taste right out of a plastic cup and put it in the glass or put it in the mug and it tastes totally different, same tea, that's purely a subjective biasing by the vessel you're drinking out of. Ophelia - Because we're looking at the complex enjoyment of the food, it will actually change people's overall perception. They will think that it's a more enjoyable experience and then they will refer it back to the wine and think it was a better wine. Chris - Okay, answer me this. What can we do about Brussels sprouts, universally loathed by some, loved by others? How do we turn them to everyone's favourite vegetable? Is it possible to play the same trick with Brussels? Ophelia - Yeah, some people might not like Brussels sprouts because they have more bitter receptors in the tongue. So, for this part of the population, which we call supertasters, maybe there's nothing to be done. But for other people, you might try changing the colour of the plate. With a blue plate, it will taste saltier and with a red plate, you will bring the kind of sweeter flavours on the Brussels sprout. Chris - If I want to max-out on people's enjoyment of my Christmas dinner, give us some tips then. What should we actually be doing to give people the best Christmas experience with their dinner? Ophelia - Well, probably taking a cooking class before will help. Chris - That would help, that's true. Ophelia - The kind of research I've been involved in is looking at ways to improve your flavour experience without touching the food itself. So, think about the visual appearance of the food. So, if you add some colours, it will make you expect something more intense and it will make it taste more intense. Chris - Does that actually get borne out if you give people a more colourful meal than a more bland looking meal, but it's the same stuff that tastes the same. Do they say, "Wow! That tastes great!" versus this that tastes bland? Ophelia - The colour intensity can improve the perceived intensity of flavour, absolutely. Up to the point that if you give people just a little bit of red dye, lots of people will start saying, "It tasted raspberry" although there is nothing but colour in it. Chris - Is it true someone did an experiment where they got a glass of white wine and they stained it to look like red wine and they took some identical wine without the stain in it and said to people would sample these two and people thought they were drinking red wine and white wine, but in fact, they were the same thing? Ophelia - Yeah. So, an experiment which has been conducted by a winologist. Ophelia - Yeah and Frederic Brochet. They were trying to show how important vision is in generating expectations. Of course, what is tricky here with wine is that it's a very social thing. So, people didn't want to look like fools and they probably reported kind of red fruit flavours because they didn't want to say something else. So, it's something that we know as a huge influence but there's something very complex going on with these wine examples. Something you might be looking at also is the candles you will light. Scented candles make a difference to how much people will enjoy the food but also, how strongly they will remember the meal. Probably, the perfect meal is the most memorable one. Chris - Indeed because you want people to come back. So, what can I do then to make people want to come back? Ophelia - Give them good food, good company, good jokes. But also, if you give them a smell that connects to their previous happy memories of Christmas like scented candles with pine tree or cinnamon. They are likely to connect this episode with their previous happy memories of Christmas and it will improve their experience. Chris - Do restaurateurs do that? Do they, by dishing up the peppermint at the end of the meal or something equivalent, is that their way of sending you home with a signature smell that reminds you of the wonderful occasion you've just enjoyed so you are likely to go back. Ophelia - Absolutely. We have this example of Heston Blumenthal at the fat duck where it actually gives you a smell when you go out of the restaurant, which is the smell of a sweet shop, which connects you childhood memories and makes this final touch when you go - it extends the memory of the wonderful meal you had. 40:03 - Is wine really the best medicine? There are a lot of mixed messages about the risks and rewards of drinking wine. So, what's true and what's not? Roger - It's very clear that moderate drinking can be beneficial in terms of reducing heart disease. Chris - Good. That's a relief. Roger - For a man, that means 2 to 3 units of alcohol per day is sufficient to have a protective effect. As soon as you go over 4 or 5 units per day for a man, you start to have harmful effects. So, the fact that the stories about benefits of wine and adverse effects of wine, it's all about what level of drinking people are undertaking. What's also clear from my research is certain types of wine have greater benefits than others. So, if you're in this window of moderation and you have a wine that's rich in tannins, then they can have an additional protective effect on your heart and therefore, be beneficial to a greater degree than other alcohols including white wine. Chris - So, there is some chemical evidence and some chemical rationale for why wine should be good for me. It's not just that when you're relaxing with your friends, you're in convivial surroundings and enjoying your drink just happens to be going along with that. But it's the surroundings and the lifestyle that's better for you than the wine itself. Roger - There are enough studies to show that moderate drinking has a beneficial effect. However, that lifestyle factor is also important. Alcohol drunk with food is less harmful and therefore more beneficial than alcohol drunk without food. Chris - What about then if I had grape juice because wine at the end of the day is fermented grape juice, isn't it? If I compare grape juice with wine that it turns into, does grape juice have these benefits or is it exclusively the preserve of wine? Roger - Grape juice is a very high sugar drink. So, excessive consumption of grape juice can also be harmful for you in the same way as excessive alcohol consumption can be harmful. What makes the difference between wine and grape juice is when you make wine, you ferment the juice with the pips and skins and with the red wine, you extract all the colour from the skin and the tannins from the pips. 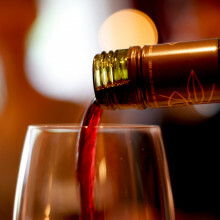 It's these tannins that confer these extra beneficial effect over compared to other alcoholic drinks. Chris - What are they doing? Roger - What we know from a number of experimental studies is they protect the blood vessels in a way that you're less likely to develop the lesions that lead to heart disease. So, those protective effects of grape pip tannins can only therefore be achieved with a tannic wine. So, modern style wines, which are often made without that long period of extraction to get all the tannins out of the pips, are actually not very different from a white wine in terms of the likely beneficial effect. Chris - So, white wine doesn't really have a beneficial effect. Red wine might have a beneficial effect and red wine with lots of tannin in it and lots of what's in the skins, that should have the best effect. Roger - That's correct, yes. Chris - But does that go hand in hand with flavour though because obviously, the one thing people are drinking when they have a new glass of wine, they're not thinking first and foremost about their health. They're thinking, "Does this taste nice?" Roger - To some extent and that's because we've developed this habit of drinking wine without food. As soon as you have a tannic wine and combine it with food then a lot of those tannins disappear in the background because they're masked by the foods you're eating while drinking the wine. Chris - Tannins are in tea as well so can I just get the same benefit from having a cup of tea? Roger - The tannins in tea are slightly different from the tannins in wine. The tannins in tea are smaller molecules and actually, more astringent than your grape pip tannins. And so, there's not really good comparison between tea and wine in terms of the likelihood of beneficial effects. Chris - Shall we have a go and just try some because I know you've got some bottles there and I'm getting thirsty frankly. What are you going to serve up first? Roger - What I've got here first is a pinot noir wine. Now pinot noir wines are actually tentatively made in a very light style because people are looking for the fruit flavours with the pinot noir. Actually, when you look at this wine, there's not much colour to it either. Chris - It looks like Ribena really. It's very thin, isn't it? Roger - Exactly. This to me is very much a white wine pretending to be a red wine. Chris - But this was not very expensive. This was about 7 quid in the supermarket. So, it doesn't smell too bad. A bit thin. Roger - Actually, it feels very light in style. There's no tannins at all. There's a sort of fruity after taste, which is a mixture of cherry flavours and black fruit flavours. But really, it's not much in terms of the wine structure. Chris - Right, so that one you're saying would be less good for our health. Roger - There's really little advantage of a wine like this compared to the sort of modest health benefits you get with a white wine or indeed drinking small amounts of beer. So actually, those type of drinks actually equate to exactly the same effect. Chris - Okay. So, this one, this is the big daddy of the tannins. Roger - This is the big daddy of the tannin-rich wines. This is a sagrantino di montefalco wine from Umbria in Italy. Sagrantino grapes yield the most tannin-rich wines you can find in the world. Chris - Well, it's got a very big flavour. It's very broad. It's actually quite sharp. It's not smooth. It's a bit sharp, but it's got a lovely flavour. Roger - What you notice very strongly is the aftertaste of tannins in these wines. Chris - It's quite bitter afterwards isn't it? Roger - That's right but that bitterness would disappear if you had some food with it. You wouldn't notice it. But it's these tannin-rich wines that are the most protective when it comes to - if you think that red wine is good for you, moderation is important but then have a tannin-rich wine. Chris - We've talked a lot about how the wine contain these tannins and how they correlate with good health but biochemically, when I drink this and it goes into my bloodstream, what actually is it doing to protect my heart and brain? Roger - All of your blood vessels have a lining which is called the endothelium. It's a single cell layer and it produces a gas called nitric oxide and a vasodilator called prostacyclin. Chris - This opens blood vessels up. Roger - This opens up your blood vessels and it stops your platelets being sticky. So, by preventing your platelets from being sticky, your blood is less likely to clot. Chris - But Roger, how much of this would I need to drink in order to get those beneficial effects at a clinically relevant level, in other words, a level that will affect my health outcome? Would I have to drink so much of this wine that effectively, I'll have to be an alcoholic with a liver problem before I actually protect my heart? Roger - This type of wine will typically have about 5 grams per litre of total polyphenols and these are all the natural chemicals that come out of the skin and the pips that give you the tannins. Now, the grape tannins would have about 2 grams per litre. Now, that means that if you drink a third of the bottle,l you'll be consuming somewhere in the order of 700 milligrams of flavanols. We know from other experimental work the sweet spot that 700 milligrams of flavanols, you're really in the sweet spot of protecting your blood vessel from heart disease. Chris - Well, let's polish off our Christmas dinner with a look at some chocolate because you can't have Christmas without chocolate. This also has a lot of claims made about the health benefits, doesn't it? Are they grounded in good scientific fact? Roger - There is a health claim for dark chocolate. The health claim is that if you consume 200 milligrams of coco flavanols per day then that will maintain the health of your blood vessels in exactly the same way we're talking about grape pip tannins protecting your blood vessels. Unfortunately, most dark chocolate doesn't contain 200 milligrams per flavanols in a suitable amount to eat without you getting overweight. Roger - Coco levels or the percent coco solids is incredibly misleading because it has no bearing on flavanol content. Chris - What do they put in instead then if it's not coco with flavonoids? What are they putting in? Roger - There's two elements to chocolate. There's the coco mass and the way the coco mass is manufactured, if you ferment it for a long time and it gets really hot, you destroy the flavanols in the chocolate. The other thing is, you can take a coco mass and then dilute it with coco butter and you can still call the coco butter percent coco solids. So, you can look at a bar like the one I have here that's marked 85% organic and you're thinking, "Hey, that's a great buy. It must be good for me." But it's got coco mass and then coco butter as the coco solids. Chris - Can we actually tell if we taste some? Can you spot the difference? Roger - I think you're going to tell as we move up the scale. So, I'm going to start you off with this 85% and not very good and it's smooth because of the coco butter and a low flavanol coco mass. Chris - What's the last one? Roger - Well, the last one, this is an experimental chocolate. This is truly the healthiest of healthy chocolates. This is a 3% flavanol chocolate. Chris - Is this natural or was this made to have extra? Roger - This is made to preserve in the manufacturing process all the flavanols that are there in the coco to start with. Chris - Now that's nice. Roger - That's nice because now, we're back at 80%. So actually, this has got less coco solids than any of the other chocolates. Chris - But it has a funny aftertaste. Roger - The aftertaste is the coco flavanols. Chris - I'm not sure I'm so keen on these coco flavanols. I think I prefer wine. Roger - It's a bit like the aftertaste of the tannic wine though. You have to agree with similarity. Chris - Answer me this, if I've overdone it with the wine, will any of these things help to offset my hangover or is there anything I can do to prevent a hangover? Roger - Obviously, to avoid hangover is not to drink too much. Chris - A bit late for that. Roger - An old fashion way to try and get over hangover was the hair of the dog. Chris - Yeah, so having another drink. Does that work? Roger - It doesn't work well and it's the first step towards alcohol dependency. It works because actually, most alcoholic drinks, these what are called congeners and other substances which your body has more difficulty in metabolising. And typically, in many alcoholic drinks, there's a bit of methanol. It's produced as part of the fermentation process or the wine making process. What the hair of the dog does is actually stops the metabolism of methanol because ethanol, which is the alcohol that people are liking to drink, is preventing it being broken down into formic acid and formic acid is a neurotoxin. So, the hair of the dog works by allowing you to get rid of the methanol in other ways, without it being broken down to this harmful neurotoxin. Chris - So, the best bet then is actually just to rehydrate and don't drink too much in the first place. Roger - Absolutely. I mean, that's the safest way to do it.